We take a closer look at three classes with a vegan angle. It’s not every day you get the chance to learn how to make vegan food from an acclaimed concert pianist, but that is just one of many unique, plant-based experiences that will be on offer at this year’s Common Ground Country Fair. Taking place from Sept. 22 to 24 at the Maine Organic Farmers and Gardeners Association (MOFGA) fairgrounds in Unity, the 41st annual fair includes dozens of plant-centric classes, two farmers markets, two food courts with veg-friendly vendors, an herb tent, a demonstration of how to make vegetarian bean hole beans (served at noon each day), multiple orchards and gardens, and an exhibition hall loaded with displays of prize-winning vegetables, fruits and herbs. MOFGA has been intertwined with the vegetarian movement from its start. Vocal back-to-the-landers – and vegetarians – Helen and Scott Nearing, who ate simple, mostly vegan foods, drew many of MOFGA’s early members to the state and were active at the organization’s start, including speaking at the first fair. Four decades after its humble beginnings in my hometown of Litchfield, the Common Ground Fair continues to serve up plenty of plant-based eats. But the busy food courts aren’t the only places to sample the delights of Maine’s organic vegan cuisine. The fair includes a mind-bogglingly long list of classes, many on how to grow, forage and eat plants. I called up the instructors of three of the especially interesting-sounding classes to find out what recipes and techniques they plan to share with fairgoers. Concert pianist Masanobu Ikemiya and his wife, Tomoko Ikemiya, a former psychologist who now manages his career, will teach a raw vegan class in the Country Kitchen on Sept. 22 at noon. 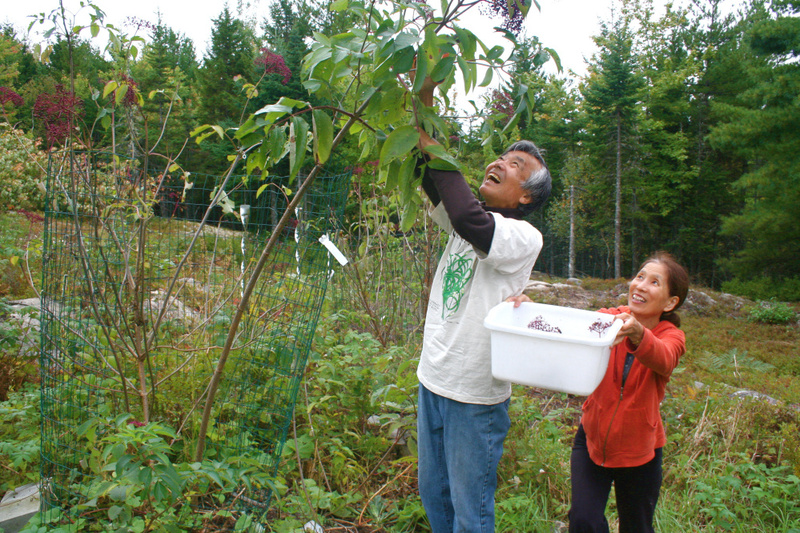 “We are passionate about raw food because we have had such a life-changing experience eating these life-changing foods,” said Masanobu Ikemiya of Peace Farm – where they grow their own food – in Bar Harbor. Ikemiya is known for classical performance and founding the New York Ragtime Orchestra. He is also the founder of the Arcady Music Festival. Before his busy music career, Ikemiya was a Buddhist monk, which may explain why he is drawn to the energy of raw foods. For their demonstration, the Ikemiyas will make use of local, organic produce that is available the weekend of the fair. Because of this, their menu isn’t set in stone yet, but it’s likely to include a raw corn chowder made with pureed cashews; root vegetable hummus wrapped in shiso leaves; and an apple dessert. The Ikemiyas, like most raw food enthusiasts, don’t eat 100 percent raw food. They do eat some cooked food, particularly in winter. Parents, hikers, sailors and outdoor enthusiasts will want to check out the How to Make Fruit Leathers class taking place in the Hayloft on Sept. 22 at 1 p.m.
Liz Lauer of the Blanchard Lauer Farm (located in an unorganized territory an hour and a half north of Bangor), and Cammy Watts of Super Chilly Farm in Palermo are teaching the class. Watts calls Lauer “the queen of fruit leathers,” and both women have been making the portable, dried food for decades. Both Lauer and Watts say that making fruit leathers is pretty simple: you make a fruit sauce, run it through a food mill, and then dry it. However, like anything in the kitchen, there are pitfalls to avoid and techniques that make things easier. The class will cover various drying techniques (in the oven; in a dehydrator; above a wood stove; in a greenhouse; in a solar dryer); flavor combinations; and tips on how to get the leathers to dry evenly and – most crucially – to peel off of the drying surface. “That’s the tricky thing,” Watts said. Lauer dusts each batch of fruit leathers with arrowroot powder, which she said takes away any stickiness. By the time the fruit leather has dried, the powder has been absorbed. Plant-based foods enthusiasts, foragers and adventurous eaters will no doubt fill the seats in chef Frank Giglio’s class, How to Eat an Acorn, on Sept. 23 at noon in the Country Kitchen. Giglio, who farms at Three Lilly Farm in Thorndike, is a wild food expert and a private chef who has been cooking with acorns for the past five years. The catch, of course, is that you can’t buy acorn flour in a grocery store. You need to make it yourself. Giglio plans to touch on the process of turning whole acorns into a usable flour, which involves soaking the acorns to remove tannins, grinding, drying and grinding again. Those seeking more detailed instructions will be directed to Christopher Knapp and Kerry Sullivan of the Koviashuvik Local Living School in Temple, who will teach three classes on processing acorns into flour (10 a.m. Friday, 1 p.m. Saturday, noon on Sunday). “It takes about a week from start to finish to make them into an edible flour,” Giglio said. For his class, Giglio will share at least four recipes that incorporate fresh produce in the market the weekend of the fair, possibly acorn hummus (the acorn flour takes the place of chickpeas), crackers and buckwheat-acorn injera bread. Everything will be vegetarian and some items vegan. Giglio will provide instructions on how to make all the dishes vegan and gluten-free.